Seven Keys to Baldpate is a 1913 play by George M. Cohan based on a novel by Earl Derr Biggers. The dramatization was one of Cohan’s most innovative plays. It baffled some audiences and critics but became a hit, running for nearly a year in New York, another year in Chicago and receiving later revivals; Cohan starred in the 1935 revival. Cohan adapted it as a film in 1917, and it was adapted for film six more times, and later for TV and radio. 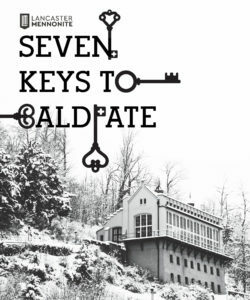 What happens when William Magee agrees to try and write a book in under 24 hours at Baldpate Inn, a summer resort that is closed for the winter. He is given the one and only key and locks himself in to begin his task, only to discover that he doesn’t have the one and only key. His night of lonely work is interrupted by a host of others including an attractive newspaper reporter, a charming widow, the eccentric hermit, the corrupt leaders of the town, and of course the police. Don’t miss this mysterious, melodramatic, comedic farce to find out if Magee accomplishes his task.